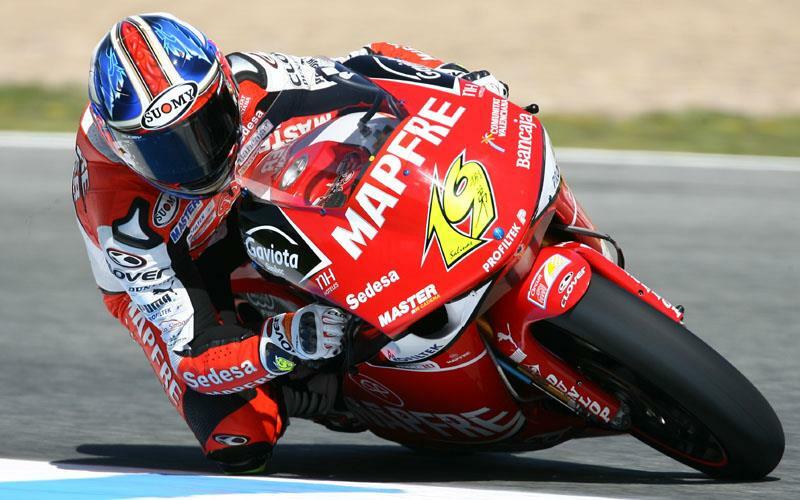 Alvaro Bautista has taken pole position for his home 250GP in Jerez after vying with Finland’s Mika Kallio at the top of the timesheets. The Aprilia man took control of the second qualifying session with around 10 minutes to go and follows Jorge Lorenzo's impressive home form in Jerez. Mika Kallio looked to have grabbed the top spot until Bautista put in a charge 10 minutes from the end of the session. But in the end it was Kallio’s provisional pole winning time from yesterday that saw him secure second on the grid for tomorrow’s race as he failed to improve on that time today. There was concern at the end of the session as Alex Debon as he came off his Lotus Aprilia and lay by the safety barriers. If fit for tomorrow’s race, he will start from third place on the grid. Rounding off the front row of the grid is Thomas Luthi who managed a best lap of 1:43.596 today to see him claim fourth on his Café Latte Aprilia. Eugene Laverty came off his Blusens Aprilia when he high-sided less tan 20 minutes in to the session. Laverty will start the race from 20th place with his best lap of 1:46.034 the quickest form the two sessions. His final lap of the seven he managed in qualifying two before crashing was the fastest at 1:46.503.